After months of planning, a summer of construction, a partially collapsed ceiling, and other myriad obstacles, the Music Department was finally able to move back into Room 218, our venerable choir room, on Oct. 19. 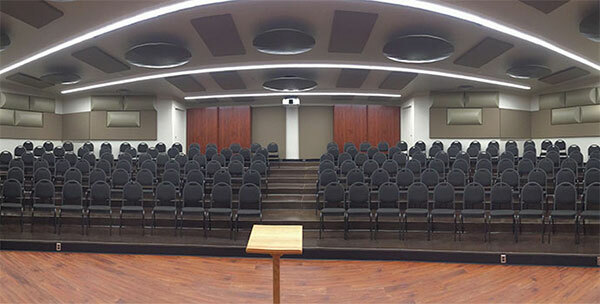 The remodeled room serves multiple purposes: it is the rehearsal space for all of our choirs (The University Singers, PolyPhonics and Early Music Ensemble), and the Arab Music Ensemble; it hosts our large general education (GE) courses, vocal practicum, master classes, student recitals and senior recitals, faculty and guest artist presentations, large departmental meetings, and the occasional post-Performing Arts Center performance reception. Remodeling a room that serves many purposes is a significant challenge, and we owe special thanks to our project manager from Facilities Services, Dave Norton, and our architect, Stephen King. The acoustics have been improved tremendously. Air handling is now almost inaudible, and the carefully placed acoustic treatments on the ceiling and walls have added a glorious resonance to a rather dry room. We now have whiteboards for classroom use (no more chalk dust in pianos! ), an improved sightline for the enlarged overhead screen, and side handrails for safer negotiation of the risers. Aesthetically, the room is visually pleasing, with new wood flooring complementing the varied color scheme, while the paneled walls and ceiling reflectors add textural interest. Room 218 occupies a significant spot in the lives of our students. For incoming freshmen GE students, Craig Russell’s opening Music Appreciation lecture is a memorable introduction to the wondrous possibilities of being at college. Room 218 is also where our music majors auditioned for the program, met with the entire faculty, rehearsed, took classes, performed in student recitals, and for many, gave senior recitals. It is where our department says thank you — and goodbye — to our graduates in our own commencement ceremony. It is, to borrow a phrase, where our departmental “circle of life” takes place, and we’re very happy that this cycle will now occur in an attractive, resonant home. The Music Department was pleased to take delivery this summer of a fleet of new Yamaha pianos. This delivery immediately upgraded our piano inventory and is a major step forward in dealing with the concerns our program accreditors had about our aging equipment. We received seven beautiful upright Yamahas and four new, cutting-edge hybrid AvantGrand pianos. The AvantGrand combines sophisticated sound sampling with an ingenious speaker array set up to project sound out of a grand piano shape in as realistic a fashion as possible. The AvantGrand’s action is that of an acoustic Yamaha CIII grand piano. Additionally, the pedals have the feel and responsiveness of a grand piano’s pedals. This hybrid will never need tuning, but its action — like that of an acoustic piano — will occasionally require a technician’s attention. Needless to say, the Music Department — and especially our students who practice the piano — are delighted with this significant instrumental upgrade. 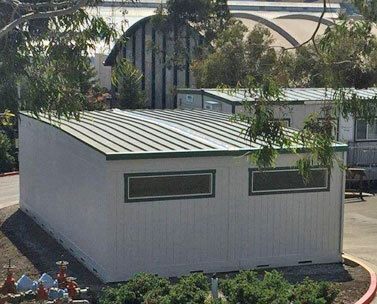 The Mustang Band now has an “armory” — a 40’ x 24’ modular near the south end of the Davidson Music Center. It is used to store marching band uniforms, sousaphones, marching percussion, colorguard equipment, and much more, which previously had been in various locations in the music building. A walk-through video is available online.